When SQL Server 2005 was released, the added functionality of Database Mail came with it, giving us the ability to use SMTP to send email from SQL Server instances. This was a huge leap forward from SQL Server 2000 SQL Mail, in that you no longer needed to set-up a mail client first (such as Outlook) to send emails. If for some reason you’re still using SQL Server 2000 somewhere (I know people that do! ), you would have to setup a MAPI client first, in which case this article is worth a read. NOTE: Database Mail is not supported in Express Editions of SQL Server, although I have heard of reports that 2008/2012 Express Editions can still be configured using the method I’ve outlined in this post (haven’t tested this myself though). However, this can become quite time consuming…especially when you’re setting up Database Mail for multiple instances! The second method is to use Transact SQL (T-SQL) and stored procedures to enable and configure Database Mail, which is much quicker, and less prone to human error, after the initial run has been tested and confirmed as working. Before running any of scripts below, I would take a backup of your system databases (master, msdb), and ensure you have sysadmin rights. At this point, the SQL Server Agent needs to be restarted. If it isn’t, the Database Mail configuration changes will not be picked up, and the Database Mail process will not start / function correctly. There is a good set of articles on MSDN for troubleshooting Database Mail problems here. Thank you so much. Amazing help. All these settings work wonderful . I need to send my error message about why the task has failed in the body of the Mail . How do i send the error msg in the body ? Can i call a stored procedure to send a customized mail with error as body Whenever a Certain JOB fails to execute properly ?? I mean how do i call a stored procedure when a Job fails ? Good day kind sir and thanks for posting this! 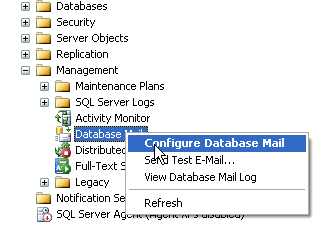 I’m not sure about this but I don’t seem to have a “Database Mail” under the Management nodes in the Object Explorer. I’m pretty sure I’m not using an Express version of MS SQL Server 2008 so I’m quite baffled as to why it’s not there. Would you be so kind to let me know if you have any idea on this, please? This was a great help and considering how time consuming GUI is this saves me time as well. Thank you so much for sharing. Only thing I did differently was enable the Database Mail using the Facets (right click on the server -> Facets -> Surface Area Configuration) because I was testing it on my notebook which is not a server, so the Registry entry didn’t work, but everything else did it. 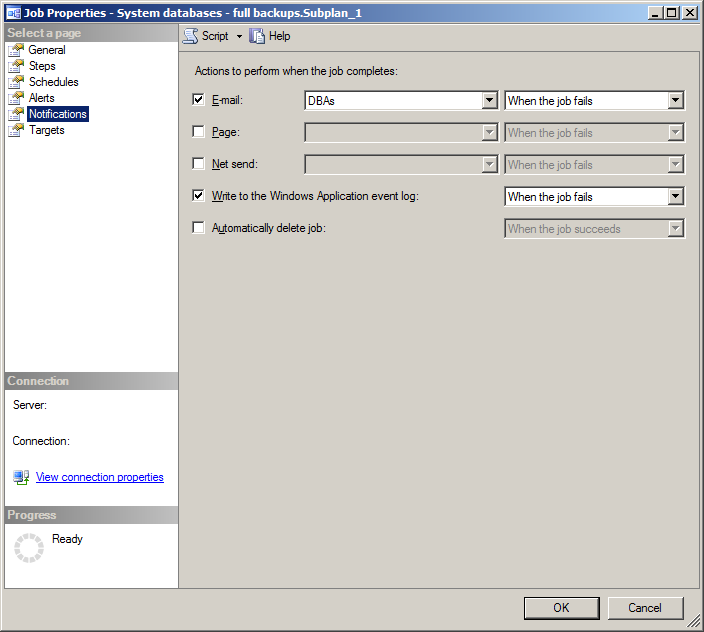 Even in Sql Server Express version you can configure Database Mail using the Stored Procedures. Thanks for the post . DB mail configuration done in 5 minutes . Great post, had DB Mail setup on SQL Express and worked first time! Great piece!!! Saved me a bunch of time looking for all this information. Yes, indeed!!! I was looking for this! Simple and Objective!! Really great and saved my day thanks!! Thank you very much indeed, easy and intuitive tutorial! Thanks a lot. It is useful for me.